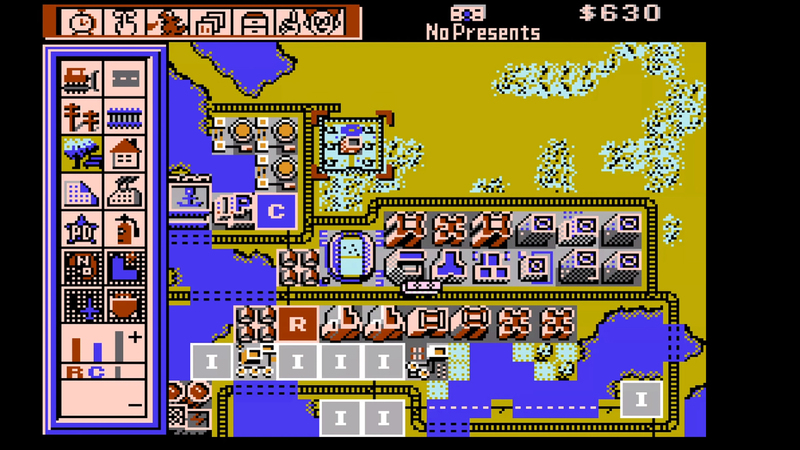 The Video Game History Foundation has done a great service to the world at Christmas by making a playable ROM of the NES prototype SimCity available to the public. Originally thought to have been lost to the world, the unfinished game was last seen by game testers at the Winter Consumer Electronics Show in 1991, before it was quietly canceled. Twenty-six years later, in 2017, two playable cartridges appeared at the Portland Retro Gaming Expo, one of which was dated December 20, 1990. One of the cartridges was sold to a collector, the other to the original owner. The Video Game History Foundation has made an agreement with the owner to create a digital copy of the game for archiving. The Video Game History Foundation has laboriously combed through the past few months through SimCity for NES changes, omissions or other oddities in the game compared to its SNES and PC counterparts. Here and there, there are small parts that are different from or even exclusive to the NES version, including a design for Dr. Ing. Wright, who was previously only seen in US marketing for SimCity on SNES, with darker shades and a traditional tie instead of a tie. Bowser is also missing in the monster attack scenarios, instead the game displays a generic monster when attacking. The NES version also lacks some things, it's incomplete after all. For certain scenarios of the SNES version, there are sprites and tiles, e.g. UFOs, however, are not attached to anything in this prototype. Some of these additional tiles are not included in any other SimCity build on any platform, which means that several other additions to Nintendo's version of SimCity were scheduled before they were discarded. The NES version also has some mathematical calculations when it comes to certain property values ​​and is actually discouraged from building and from the current tiles, such as amusement parks and train stations. There is also a glitch that allows some infinite money at the end of a game year, but it has left a function to demonstrate the game. There is also a project from a friend of the Video Game History Foundation, CaH4e3 (pronounced Sanchez), to sift through the game files and begin restoring the cut features and fix bugs in the build , As noted above, the Foundation has also made available to the public a playable ROM for anyone interested in trying out the NES prototype of the game that introduced the Urban Builder genre. For more information about SimCity archiving, visit the Video Game History Foundation website.